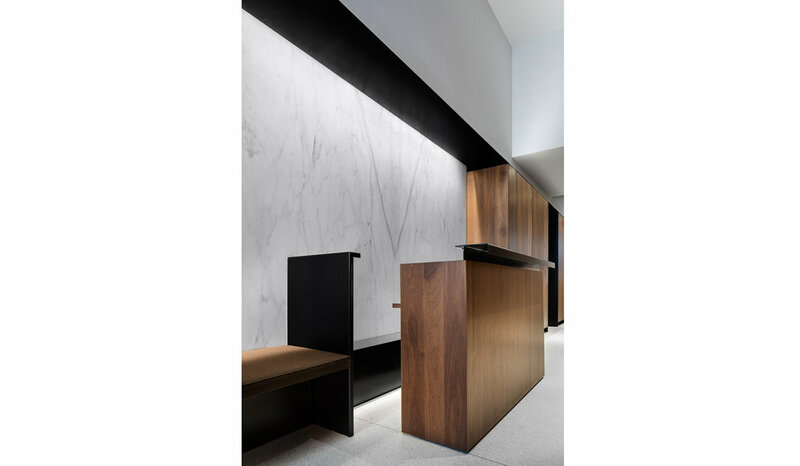 We reconfigured the long, narrow main lobby of this cast-iron building in SoHo’s Historic District, upgrading the finishes, lighting, and mechanical systems while also accommodating new requirements for a full-time doorman. Our intervention created a series of built-in elements along the east wall: a bench for visitors, a desk for the doorman, and storage for supplies and packages. The design employed a palette inspired by the building’s industrial past, with exposed brick and stone walls, terrazzo floor, and wood and blackened steel millwork. We used a concealed source to uplight the entire ceiling while adding accent lights to highlight moments like the stone wall and the existing slots in the brick wall. We reconfigured the exterior doors and provided a thermally efficient storefront system that significantly improved the functionality of the interior.